McDonald’s Guest Experience Leader Carrie Kohl helps Sheila Custer and Heather Jordan with ordering food off of the menu during the grand opening Thursday of the location on 2455 Shawnee Road. 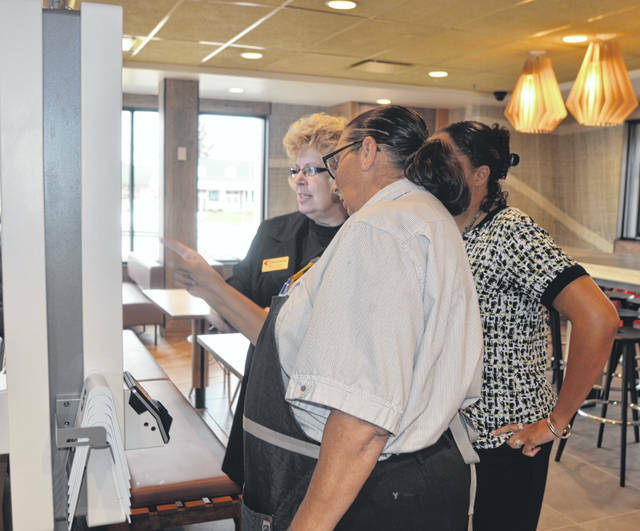 SHAWNEE TOWNSHIP — After a three and a half week renovation, the McDonald’s on 2455 Shawnee Road has reopened with technology that allow customers to order more efficiently, said Scott Shaw, director of operations. The remodeled location now has a newly decorated lobby with wood and stone floors, low and high tables, digital menu boards and kiosks that allow customers to order their food without going to the counter to order it. There are also Guest Experience Leaders who assist customers with ordering on the kiosks. This was not the first remodel done at this location. The first renovation happened about 15 years ago when the restaurant expanded and added a freezer, cooler and stock room. There was another renovation that happened three to four years ago when the roof beams were detached and the lobby was remodeled. McDonald’s goal is to remodel lobbies every seven to eight years, said Shaw. Within the last two days the Shawnee location has been working on installing new digital menu boards in the drive thru. Besides the kiosks and new digital boards, customers can use the McDonald’s mobile app on their smart phones to order their food. Through the mobile app, customers can pick up their food by parking in one of the curbside spots or walk inside and pick it up. Although there are several customers who are receptive to the new technology, there are others who believe it is taking away jobs, said Shaw. Shaw said that the corporation looks forward to building the McDonald’s brand.